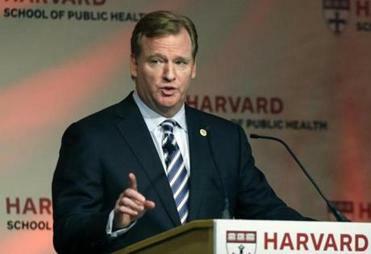 NFL commissioner Roger Goodell discussed played safety on Thursday at Harvard. An NFL retirement board awarded disability benefits to three players, including Hall of Famer Mike Webster, based on what it claimed was a direct link between football and brain injuries, PBS’s Frontline reported on Friday. The NFL, which is facing lawsuit from thousands of former players alleging damage from playing professional football, has consistently denied there was any proven link between the sport and long-term negative health effects. The retirement board consists of seven members, three representatives of owners and three representatives of players plus a non-voting member appointed by the commissioner. 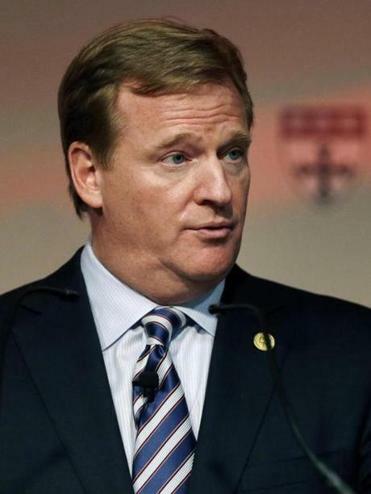 The league told Frontline in a statement that the board was not an official arm of the NFL. The board wrote in a May 2000 letter that it concluded that Webster’s disability was “the result of head injuries he suffered” as an NFL player. The revelations could be embarrassing to the NFL, or potentially damage its defense of the lawsuits it faces from former players. On Thursday, NFL commissioner Roger Goodell was at Harvard to discuss the “culture of change” he is trying to bring to the league about player safety. In a speech at Harvard, the NFL commissioner said the league is focused on finding a smart solution to dealing with player safety issues. While the NFL has adopted new rules regarding the reporting and monitoring of concussions, it is an ongoing process, even as some players insist they would try to conceal head injuries in order to keep playing and stay out of the league’s now-elongated process for returning to the field. The NFL may now have to consider how to react to the new evidence unveiled by Frontline. Bob Fitzsimmons, an attorney who represented Webster and is co-director of the Brain Injury Research Institute, told Frontline the report could be “pretty devastating evidence” and “the proverbial smoking gun” in the former players’ case against the NFL.